As a committee of the National Academy of Engineering recognized, ethics education should foster the ability of students to analyze complex decision situations and ill-structured problems. 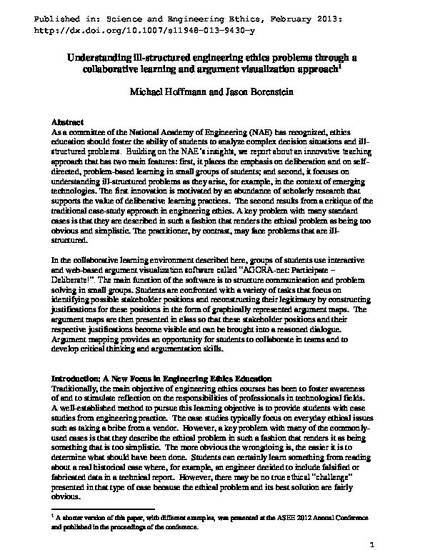 Building on the NAE’s insights, we report about an innovative teaching approach that has two main features: first, it places the emphasis on deliberation and on self-directed, problem-based learning in small groups of students; and second, it focuses on understanding ill-structured problems. The first innovation is motivated by an abundance of scholarly research that supports the value of deliberative learning practices. The second results from a critique of the traditional case-study approach in engineering ethics. A key problem with standard cases is that they are usually described in such a fashion that renders the ethical problem as being too obvious and simplistic. The practitioner, by contrast, may face problems that are ill-structured. In the collaborative learning environment described here, groups of students use interactive and web-based argument visualization software called “AGORA-net: Participate – Deliberate!”. The function of the software is to structure communication and problem solving in small groups. Students are confronted with the task of identifying possible stakeholder positions and reconstructing their legitimacy by constructing justifications for these positions in the form of graphically represented argument maps. The argument maps are then presented in class so that these stakeholder positions and their respective justifications become visible and can be brought into a reasoned dialogue. Argument mapping provides an opportunity for students to collaborate in teams and to develop critical thinking and argumentation skills.